I liked the location, The apartment was tiny but had a balcony and all the necessary kitchenware. The garden and the swimming pool were well kept. And NOBODY BOTHERS!!! The apartment discription and photos were not matching the real place. There was no airconditioner and in a very hot weather, so it was unberable to stay in the place. At night, there were mosquitos and all kind of crawelling insects. It was very unpleasant. The swimming pool was not accessable in the morning - due to the cleaning and open hours of the pool were not appropriate (opening and closing too late). Fantastic location friendly complex well looked after. This is a basic apartment which suited our needs and enough kitchen appliances to cook if you want. Recommend restaurant next door. Bring your own towels. Would revisit but would maybe upgrade from a studio. This apartment was very basic but so cheap for the location and time of year we went (June 18). The grounds were lovely, with a beautiful swimming pool. Staff were lovely also and very helpful and friendly. I would go back here if I were ever to visit Salou again. They definitely needs to change beds. Basic facilities like kettle, oven etc missing. Beware there is no plug except one in kitchen which is very irritating. There wasn't much to like about this apartment, sorry studio. I liked nearly everything about it. The place looked secure and pleasant. The sweaming pool was clean. Great location, 5 min go get to the beach. Quiet street and the supermarket was right next to the hotel and so was the restaurant. 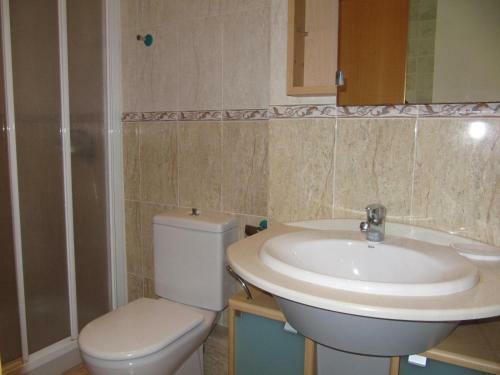 Lovely little apartment ,big fridge and spacious bathroom. A place for those who prefers simplicity. Nice garden, pool and location. 5 minutes walk to the beach and shops but still in a quiet part of town. Apartment clean and functional. Furniture is outdated and no lift, no wifi but that was all clearly stated in the ad so overall very good value for the money! location, 5 minutes to beach. supermarket next door and other shops nearby. nice pool and not too busy. One of our best sellers in Salou! Located just 150 feet from Salou Beach, this apartment complex has a large garden and a seasonal outdoor pool. Each functional apartment has a balcony, a sofa bed and kitchen facilities. 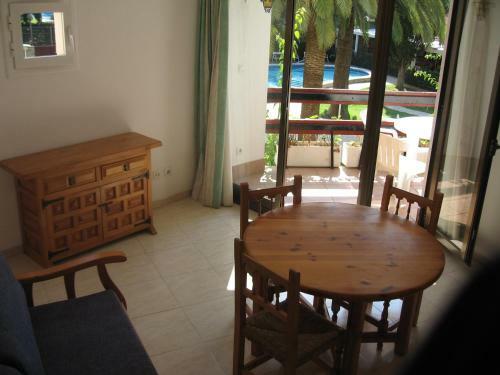 Each Córcega apartment has a bright living area and a private bathroom with a shower. Many apartments also offer garden views. Apartamentos Córcega is located on a quiet street, 1,650 feet from the lively center of Salou. There are various supermarkets and restaurants within a 5-minute walk. 뀐 Located in the real heart of Salou, this property has an excellent location score of 8.8! When would you like to stay at Apartamentos Córcega Palmyra? This functional studio has a living area with a sofa bed, a private bathroom and a well-equipped kitchenette. There is a balcony. Bed linen and hand towels are provided. Please note that the accommodations does not have air conditioning, heating or a TV. Please note the swimming pool is open from half June until half September. This functional studio has a living area with a sofa bed, a private bathroom and a well-equipped kitchenette. There is a balcony, and many have garden views. Bed linen and hand towels are provided. This functional one-bedroom apartment has a living area with a sofa bed, a private bathroom and a well-equipped kitchen. There is a balcony, and many have garden views. Bed linen and hand towels are provided. This functional two-bedroom apartment has a living area with a sofa bed, a private bathroom and a well-equipped kitchen. There is a balcony, and many have garden views. Bed linen and hand towels are provided. House Rules Apartamentos Córcega Palmyra takes special requests – add in the next step! Apartamentos Córcega Palmyra accepts these cards and reserves the right to temporarily hold an amount prior to arrival. Please note that the outdoor pool is open from 15 June to 15 September. Please inform Apartamentos Córcega Palmyra of your expected arrival time in advance. You can use the Special Requests box when booking, or contact the property directly using the contact details in your confirmation. To get the keys I had to wait for 2,5 h until the receptionist will finish her siesta.I would wish that it would be an evening porter just in case. I had a power cut in my apartment and i could not find how to fix it. So i’ve spent the night with no light.Next day when I complained they were laughing at me for the switch was BEHIND the picture frame. How i supposed to know? I was upset. The payment for the apartment could be done only by cash, for the use of credit card it was necessary to go to the main office (extra charge also applied). NO information about such special conditions have been provided or communicated in advance. Time to leave was indicated at 9.00 AM (while we arrived in the place at 20.00), we were not allowed to stay on the territory of the apartment after check out. There were no storage room in the place - everybody complained, it was such a nasty attitude towards visitors - it was first time that I was treated with such insults. There wasn't a long mirror. You get the basics in this apartment which was perfect for us. Salou isn't my cup of tea but all in all this was a great deal. 4th floor apartment with no lift, but this was listed in the information on booking so we knew about it. Great location, far enough away from the hustle and bustle, but close enough to walk. Good apartments, clean with basic facilities. Good communication, however not being able to collect keys until after 4pm can be difficult as there is nowhere to leave you luggage. Otherwise everything was good. Having booked with a group, I just followed the crowd without looking much into it. Right from check in to check out was horrible...dont get me wrong, Salou is a brilliant place and I can't wait to visit again, but il be booking somewhere else to stay. It was an ordeal to get our keys, as pick up was elsewhere and then we had to leave €150 pp deposit!! Its all in cash too, no cards. The apartment was tiny, no towels, toilet roll, kitchen utensils or even a cleaner for the entire stay. There was no safe either, which bugged me as I brought my camera equipment with me. The pool was FILTHY, it reminded me of the inbetweeners film, dead cockroaches and other filth floating in it...no loungers, bar or reception. The Two of us, and the other couples staying with us in the complex are covered in bites too. I can't recommend this place at all. The deposit was too high €150. First night we didn't have towels neither any sheets or pillow covers. Had to go to the head office and complain. Had to ask for a kettle as well.